Sometimes I don’t feel like cooking, especially in hot Florida. I love this recipe because there is minimal cooking and it is so flavorful. 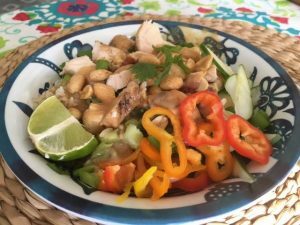 This Thai bowl can be vegetarian, balanced with nuts or feel free to add leftover chicken or steak. Chopped/sliced veggies: My favorites are green onions, peppers, cucumbers, broccoli, cabbage and cilantro. 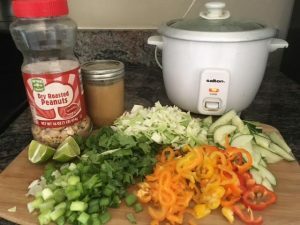 In your bowl, start with 1/2 -1 cup rice or quinoa, top with your favorite veggies (as much as you want), nuts, meat and sauce. That’s it! Are the Veges cooked in the Thai bowl?